How many of us lift up a simple prayer sometimes and ask for a sign. Just give me a sign Lord! So, a few days ago when I was driving to the beach, I saw this sign by the side of the road. Simple. To the point. What was it advertising? I didn’t see anything else beside it. Oh come on, someone doesn’t just pay for those words and not advertise a product! Well, somebody did. There has to be a story here, I thought to myself as I made two consecutive 180° degree turns in my van, just so I could digitally encapsulate forever this profound message. Simple, yet profound. 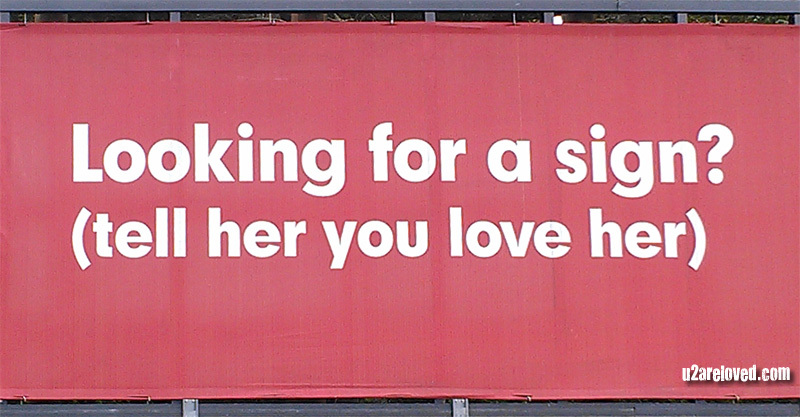 Somebody cared enough to put these words on a billboard. Somebody thought you needed to know. Who in your life needs to be told? The long term girl friend you kind of take for granted? The wife you’ve known for fifty years who already knows you do—you’re long past having to say it? What about the mother who you haven’t called in over a year? The daughter you’ve been estranged from and you’re too chicken to call? The friend who you let down? Maybe there’s a him that needs to hear it just as well. Who says men don’t need to hear it? Maybe it’s your child or teenager. Just because they have an attitude doesn’t mean they don’t long for it. Either way, if YOU ARE HERE, then maybe this is your moment, your sign. Do! Actions speak louder than words and hopefully your actions are leaving heavy carbon footprints in the heart of those you love. It’s the little gestures that count, the sweet notes, the surprise call, the dinner on the roof she wasn’t expecting, mowing your elderly neighbor’s yard, taking your daughter fishing, and a thousand other things you can easily think once you decide you’ve got the time. Say! Actions may speak louder, but words are the shadows of these deeds. Love is the loudest whisper ever spoken, if it is said true. Love is what you wear or omit when you go out in the world. Love is what you broadcast when you speak, write, sing, or create. It’s a feeling, yes, but so much more. It’s an action, a decision, and it’s never static. Love always leaves a mark. It’s so simple actually. Start with something you do. Then follow it up with something you say. Trust God with the results. Listen to good music. Take note of things that are beautiful. Appreciate life! Pray. Be patient and show kindness. Let love be your outward habit towards others. You are here. You are not lost. You are worthy of giving and receiving love. Go forward smiling with a song in your heart and with God’s blessing. If I speak in the tongues of men or of angels, but do not have love, I am only a resounding gong or a clanging cymbal. If I have the gift of prophecy and can fathom all mysteries and all knowledge, and if I have a faith that can move mountains, but do not have love, I am nothing. If I give all I possess to the poor and give over my body to hardship that I may boast,but do not have love, I gain nothing. Love is patient, love is kind. It does not envy, it does not boast, it is not proud. It does not dishonor others, it is not self-seeking, it is not easily angered, it keeps no record of wrongs. Love does not delight in evil but rejoices with the truth. It always protects, always trusts, always hopes, always perseveres. “Faith, hope, and love abide, and the greatest of these is love!” How often in my life have I been like that noisy clanginging bell? This passage is what encouraged me in January 1979 to walk into my first AA room, and through his grace I never looked back, nor had another drink. The quoted passage from 1 Corinthians 13 has always been my favorite, Liz! Thank you for such an honest and beautiful post! Thank you so much Stevie!! Yes, I sound like the clanging bell more than I care to admit sometimes! Wow–sober since 1979 that is so wonderful!!!!!! It reminds me of a U2 song-Grace. Grace makes beauty out of ugly things. Redemption stories are the best because of the hope they give the rest of us. Thanks for sharing. Another must-read for anyone truly interested in redemption stories: “Love is the Cure” —Elton John’s powerful story of his LONG “coke” addiction, the influence of knowing Ryan White and Mr. John’s ultimate recovery and humanitarian works.